Seth Mokitimi Methodist Seminary, located in Pietermaritzburg, KwaZulu-Natal, opened its doors in January, 2009 to provide quality theological education and spiritual formation for aspirant ministers as part of their journey to ordination. 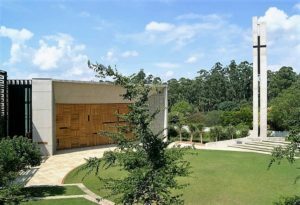 An initiative of the Methodist Church of Southern Africa, its prize-winning new campus was dedicated in 2010. SMMS was mandated by the Methodist Church to “form transforming leaders for church and nation”. Thus, the seminary understood from the start that its task was not merely to produce graduates with strong academic credentials in theology, but also to form individuals of spiritual maturity with impeccable personal values and virtues. As such, SMMS prides itself on its parallel and integrated Academic and Formation Programmes. SMMS offers Bachelor of Theology degree, Diploma in Practical Ministry and Higher Certificate in Christian Ministry. The Seminary is open to seminarians from other churches and also welcomes to its programmes private students who wish to be formed for transforming leadership within a value-based spiritual environment.